The 101 sessions comprised of three experts in their respective fields who gave introductory lectures on topics that are tangentially but significantly related to dance making. Lawrence Liang, lawyer, who presented ‘Choreographing Copyright’, began by emphasizing the nature of dance which is essentially copied or mimetic body movement. At the same time any kind of landmark art essentially rests on the concepts of uniqueness and originality. Copyright, Liang explained, relies on the romantic idea of the author, the idea of originality and the process of fixation which in the case of dance can only be achieved through video or photography. As a concept, copyright exists to protect a unique expression of an ideal. However, what would a unique expression mean in the case of dance? Liang then drew on the case of case of BV Karanth, an exponent of Yakshagana, who willed all of his literary works to a certain individual. This presents a unique problem since Yakshagana is a performance based art form. Does the bequeathing of its literary works, then, include the bequeathing of its dramatic forms also? Drawing from the lives of artists like Loie Fuller, George Balanchine and Choy Ka Fai, Liang explored important questions of violations and infringements in choreography etc. Liang finished by stating that mediums that are forced to speak to each other like visual mediums and performance based arts, so the existence of copyright should perhaps engage in questions of a sense of propriety rather than questions around right to property. The next presentation was done by Rashmi Sawhney who spoke on ‘Writing and the Creative Arts’. She remarked that she had noticed a certain resentment amongst dancers when it came to writing about their work while applying for grants and otherwise. This she said could be resulting from a subconscious bitterness against the hegemony of written language over other sensory practices. She mentioned that there exists a dual world of theory and practice, respectively occupied by academics and performers. However, as performers are slowly entering the arena of also becoming critics of the works of their fellow artists, this wall between the two seems to crumbling. 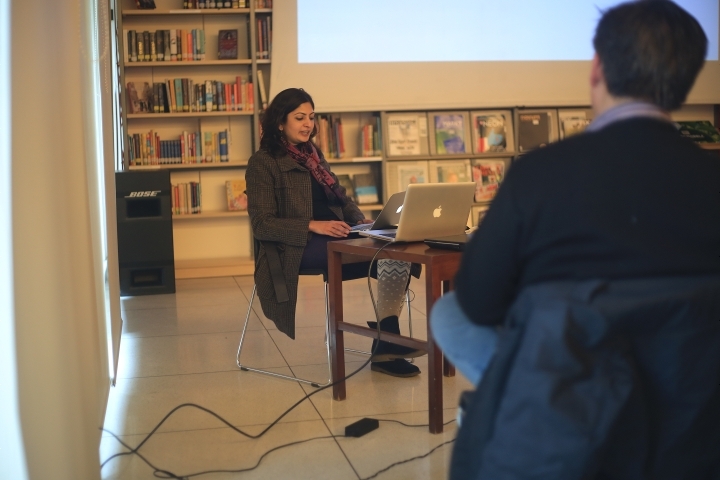 Sawhney concluded by inviting people to talk more about writing with her in the ‘clinic’ sessions on the following day. Mary Therese Kurkalang of Khublei then proceeded to make the last presentation of the session on ‘Outreach, Marketing and Communications in the Arts’ and the important role that these play in the world of dancers. She emphasized that communication is everything when talking about outreach given that every artist needs an audience. She began with basic questions – what, and why, for instance – explaining that artists must be convinced and clear about what they do. She then proceeded to the question of ‘Who?’ explaining that it is important for the artist to know his or her audience. Kurkalang concluded by giving a brief glimpse of the possible strategies that can be employed by artists for their outreach.